Since I know that I'm predisposed to stretch marks. I have some from puberty, I was extra careful throughout my pregnancy to do whatever I could to avoid getting new ones. Below are a few of my favorite products that I used to prevent them. Mama Mio - This is amazing, I haven't gotten any stretch marks on my breasts so far (knock on wood) I heard it's also amazing on your decollate to prevent wrinkles and keep your skin tight! Bliss Body Butter (Vanilla) - Smells amazing and great for right out of the shower. It's super creamy and thick but absorbs great. Bliss Body Butter (Grapefruit) - Smells great as well! I like mixing it with the Vanilla one. L'Occitane - One of my favorites before pregnancy as well and have been using it for years! 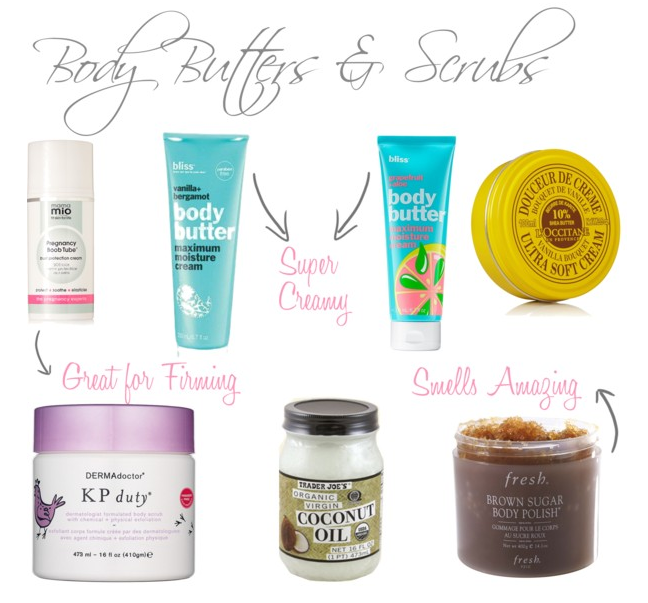 KP Duty Scrub - Love this scrub, it doesn't smell like anything, but it exfoliates really well and leaves your body super smooth. Virgin coconut Oil - I slather this everywhere! I also use it in the shower in place of conditioner.